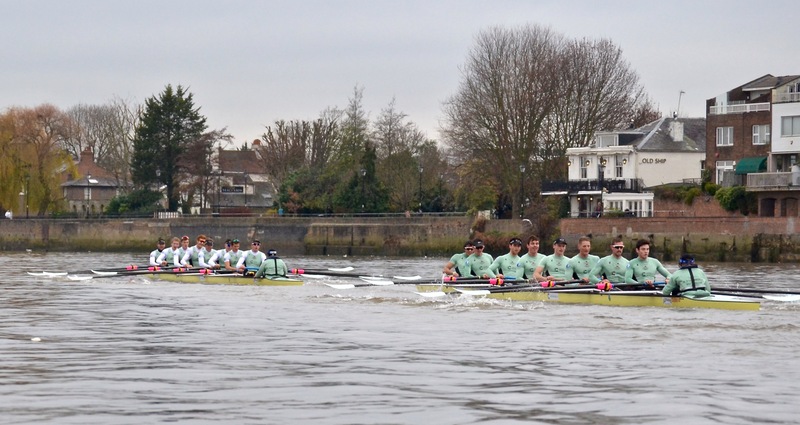 Tim Koch’s late report on the Cambridge Men’s Trial Eight’s Race held on 12 December. 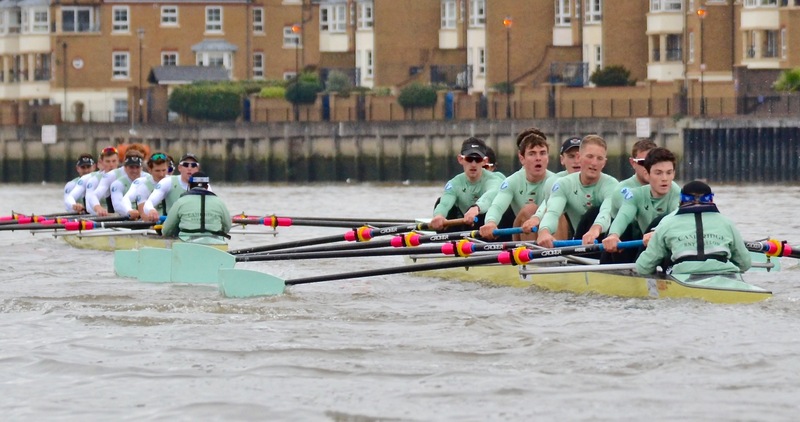 Trials for the CUBC University crews begin at the beginning of September, usually well before the start of the academic term. 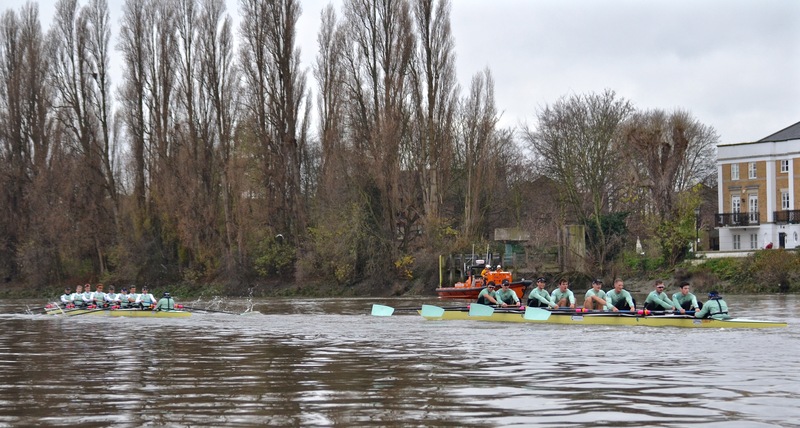 The full University Boat Race programme lasts for seven months, culminating in the race itself.….. 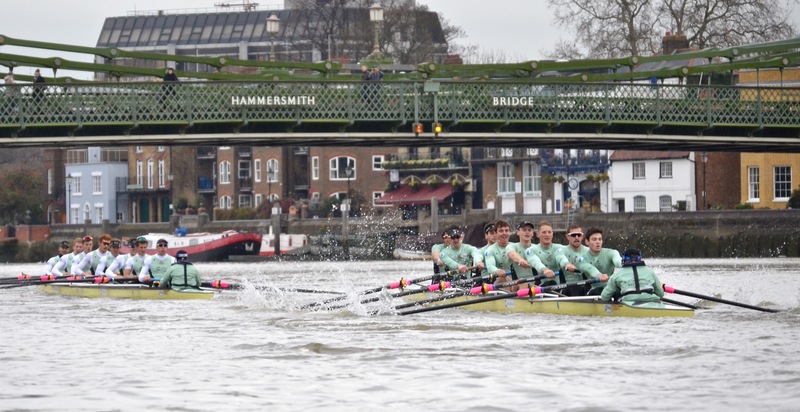 In November we race at the Fours Head of the River which is held on the same stretch of the River Thames in London as the Boat Race itself….. the only time except for the race itself that we compete directly against Oxford. 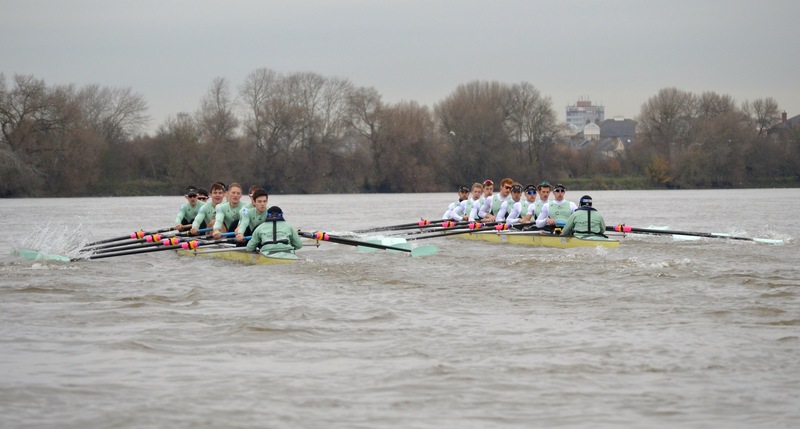 In December, the first term concludes with the Trial VIIIs Race where two equally matched Cambridge crews full of ‘Blue Boat’ hopefuls race each other over the full Boat Race course. The club begins the New Year with a warm weather winter training camp in Banyoles in Northern Spain. 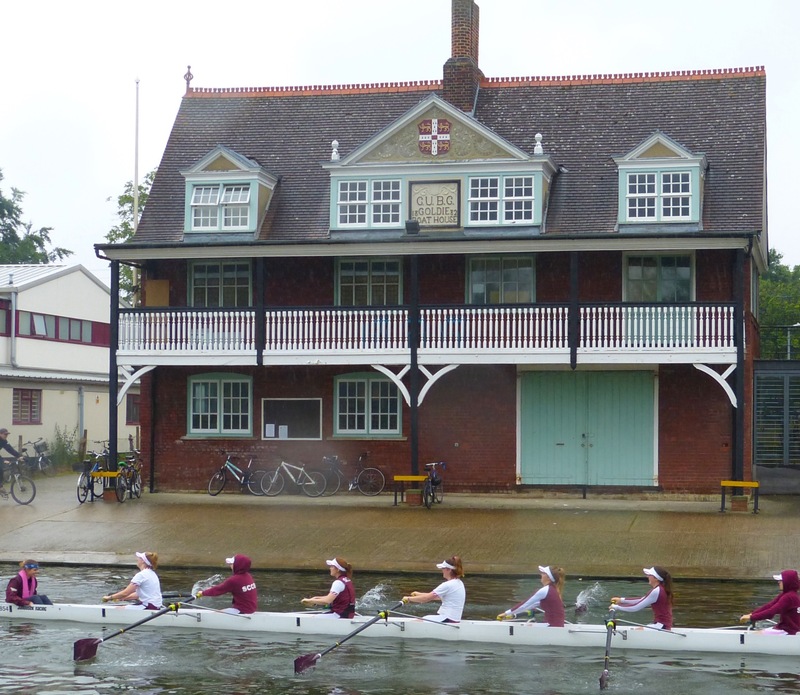 During the second term, selection is completed and there are warm-up fixtures in February and March against tough opposition (such as) Leander Club, Molesey Boat Club….. Oxford Brookes…. the University of Washington and the Dutch National Eight. 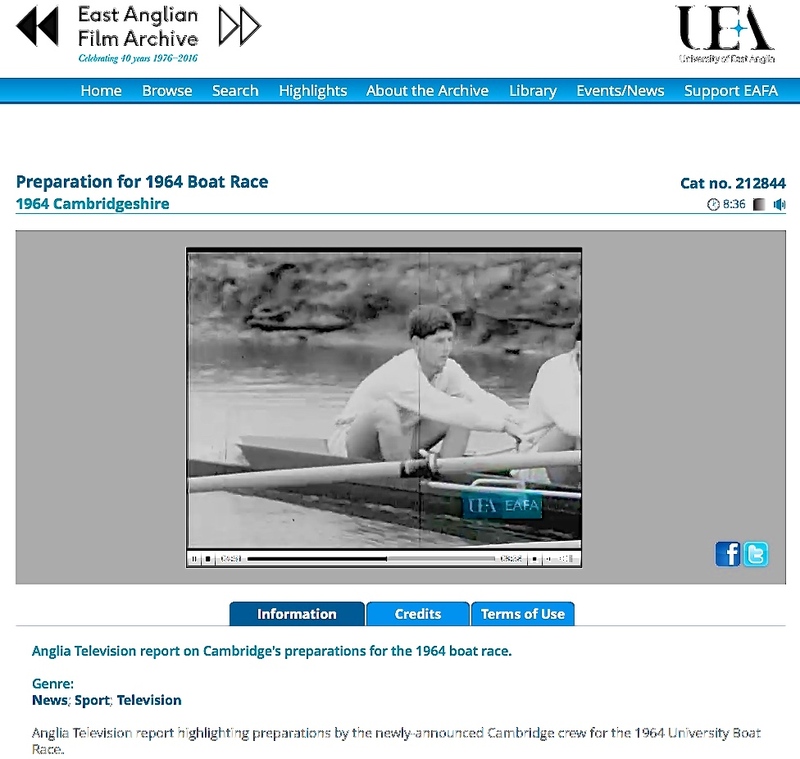 The Rowing Year was perhaps a little less intense in 1964 – when a young Donald Legget was in the Cambridge bow. Click here for a contemporary film report (it is mute for the first 25 seconds). From Tuesday to Friday, rowers and coxswains meet at Goldie Boathouse at 6:30 AM for land-training…… At 9:00 they return home to eat, work and attend lectures, labs and supervisions. By 1:30 PM they arrive back at Goldie for the drive to Ely (which takes approximately half an hour) for the afternoon water training session, returning around 5:30. On Fridays, an ergo or weights sessions takes the place of the trip to Ely. On weekends, the squad arrives at Goldie at 7:30 AM. They then travel to Ely for two water training sessions with a short break in between, returning to Cambridge by 2:30 PM. Outside the organised training times the CUBC’s world-class coaches are often available for one-to-one technical sessions on the ergos, Row Perfects or in the mirrored rowing tank at Goldie. Video feedback and analysis sessions also occur regularly after or before training sessions. Rowers and coxswains have the day off on Monday. The Goldie Boathouse on the Cam at Cambridge. It was built in 1882 and is the oldest surviving intact boathouse on the river. These days, no boats are stored at ‘the Goldie’ but gymnasium work, tanking, ergometer and weight training takes place there. Spread over twelve sessions, about twenty hours a week is spent in training. 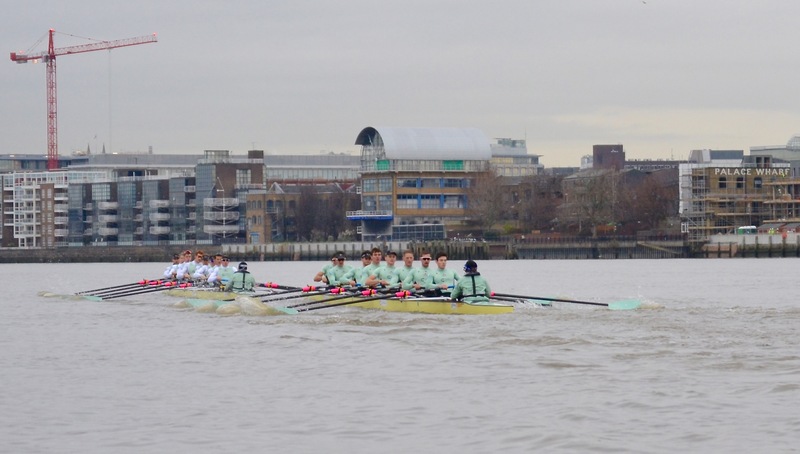 The CUBC squad has the difficult task of balancing their academic and athletic commitments. No exceptions are made for rowers at Cambridge University with respect to their workload and required attendances at lectures, labs and supervisions. 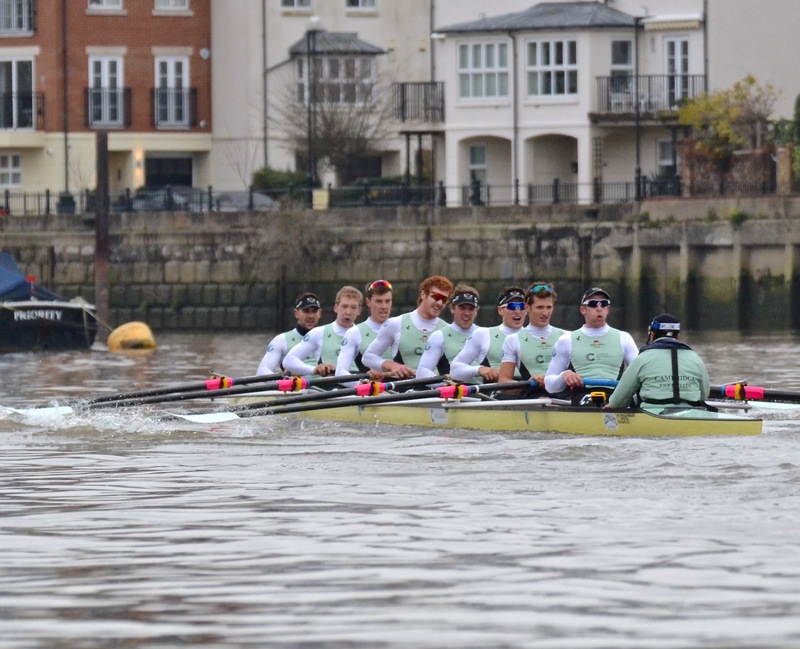 Despite this, the CUBC’s athletes achieve score higher than the University average. The President’s Prize for Academic Excellence is awarded annually and is hotly contested. Some Old Blues who followed the race, including Henley Royal Regatta President, Mike Sweeney (centre). 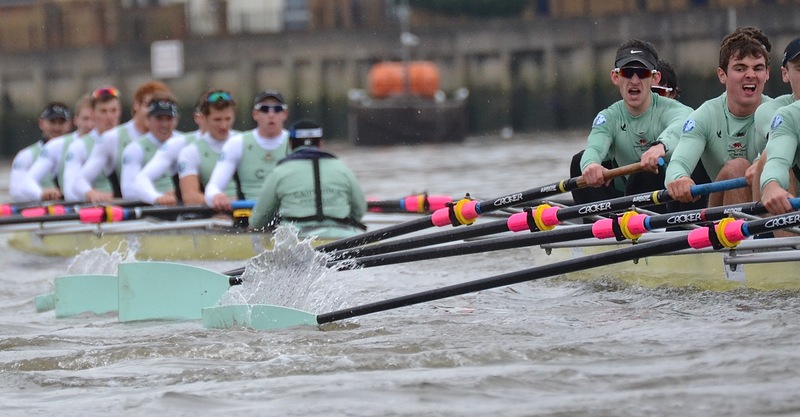 As before, I have used the race report from theboatraces.org together with my photographs and captions. The men’s race swiftly followed (the women’s race), umpired by Sir Matthew Pinsent. 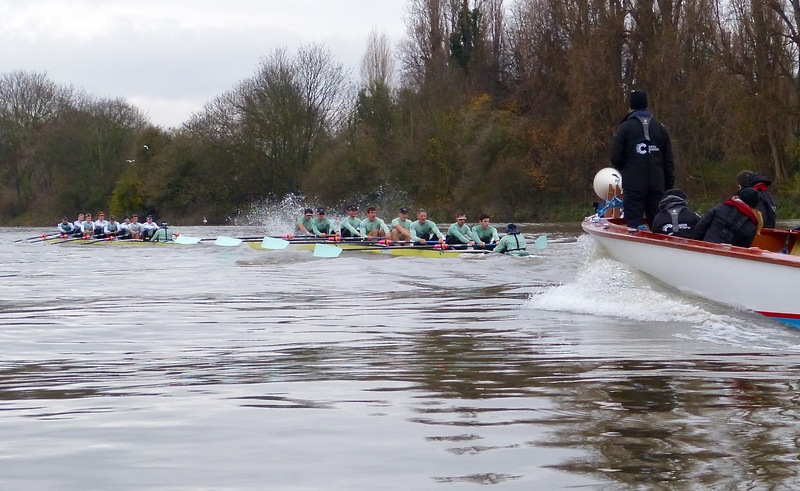 The crews Two Gs and One T, were named as a fitting tribute to long serving coach Donald Legget who is known for saying ‘two Gs and one T’ in reference to the spelling of his surname…. “Two Gs” at Putney Rail Bridge on the way to the start. President Lance Tredell was absent due to injury. In theory, “Two Gs” perhaps looked the stronger crew with four Old Blues onboard. Winning the coin toss was One T who chose the Middlesex station and at 11 the race got underway. 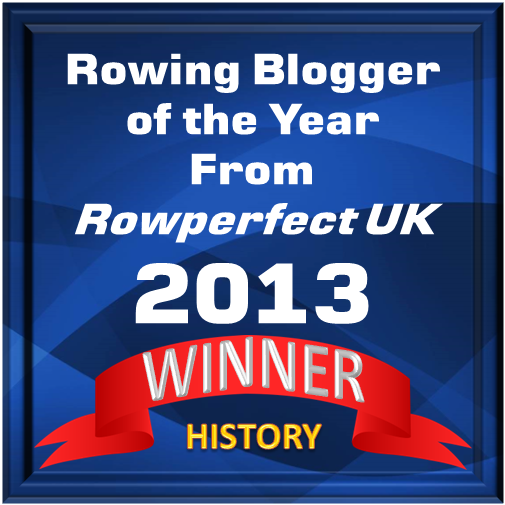 Taking the early advantage, One T, stroked by Henry Meek, were ¾ length up by the end of the Putney boathouses. The race at the end of Putney Embankment. 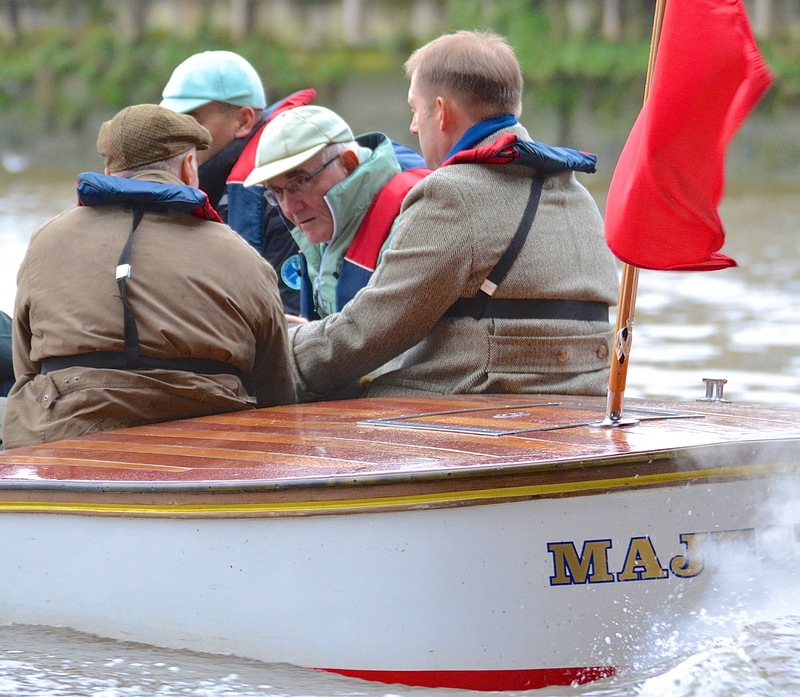 On the left (Surrey) is “Two Gs” stroked by Freddie Davidson and coxed by three times Boat Race veteran, Ian Middleton. On the right (Middlesex) is “One T”, stroked by Henry Meek and coxed by Hugo Ramambason. Full crew lists are here and crew biographies are here. With a clash of blades approaching Fulham, both crews were warned but One T used their bend to push their advantage out to a length. At the Mile Post, One T took cuts in front of Two Gs and was once again warned. Into the start of the Surrey bend, One T was a ¼ length clear but again warned as Two Gs took a push. At Fulham. For those unfamiliar with the course, follow this link for a map. “Two Gs” under pressure approaching Hammersmith. 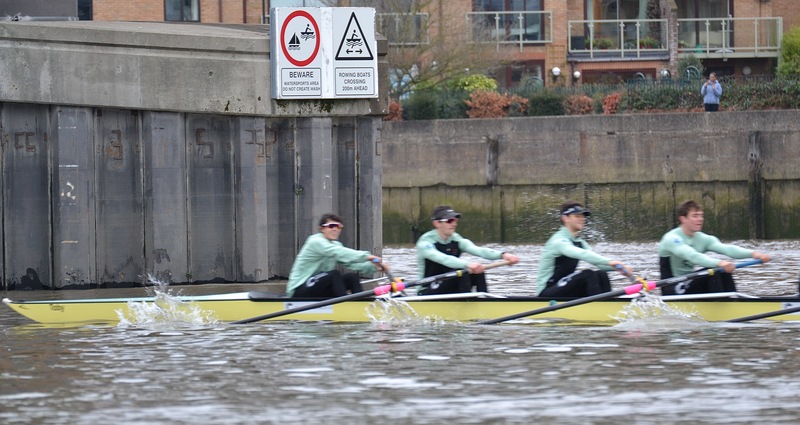 Under Hammersmith Bridge, the margin remained ¼ length clear from One T, with Two Gs holding One T down the island. Gradually increasing their advantage across the Surrey bend, the margin was ¾ of a length clear as the bend ran out. 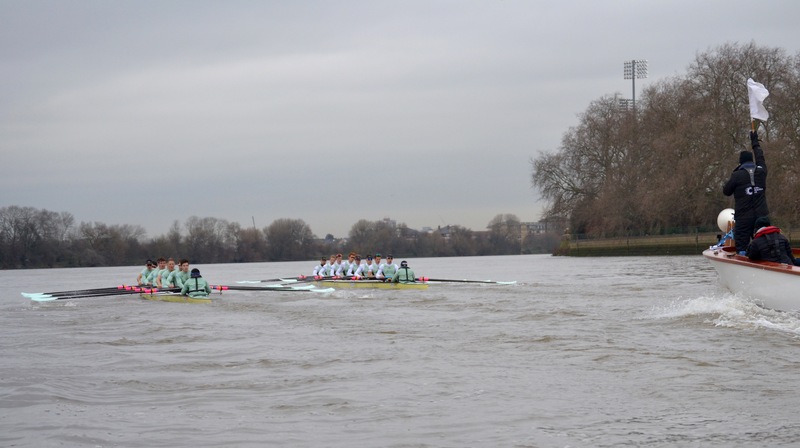 “One T” leads under Hammersmith Bridge. Passing the ‘Old Ship’ and approaching the Black Lion Steps. “One T” approaches Chiswick Pier. Both crews had to contend with bumpy waters from launch wash, with One T coping with the disturbance slightly more comfortably, pushing out to a length clear, holding it past the bandstand and under Barnes Bridge. The water gets lumpy at Chiswick. With the finish post in sight, both crews began their sprint at 500m but the margin remained unchanged. With adrenaline pumping, Two Gs managed to close the gap to ½ a length but it wasn’t enough to claim victory as One T passed the university post 1 and a 1/4 length clear of Two Gs. Approaching the second brewery on the course, this one at Mortlake. A few strokes from the finish. The race will have given coach Steve Trapmore a lot to think about – perhaps more than he would have wished. The 163rd Boat Race and The 72nd Women’s Boat Race will take place on Sunday 2 April 2017. The Cancer Research UK Women’s Boat Race will start at 16:35, with The Cancer Research UK Boat Race an hour later at 17:35. *Yes, I know ‘mano’ in Spanish does not mean ‘man’. It’s just a heading.